Plans of cairns at Yarrows. Detail of chamber, viewed from E. Digital copy of photograph. View of chambered cairn from SW. Digital copy of photograph. 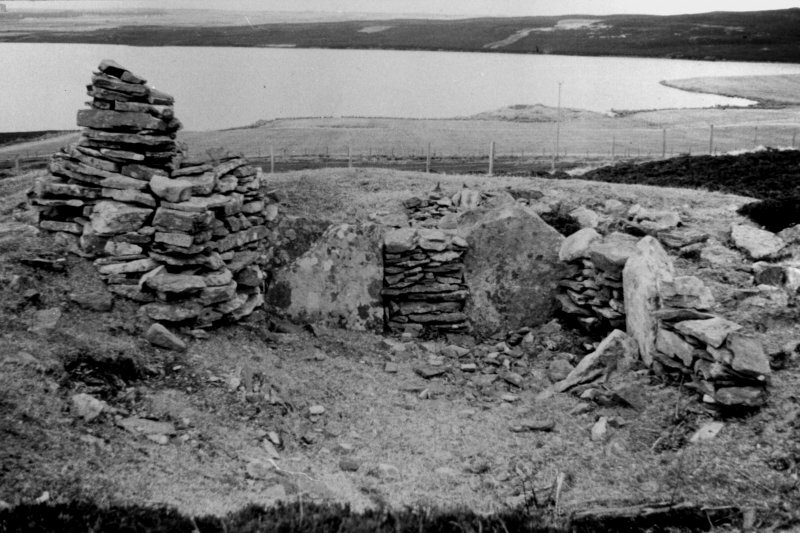 An Orkney-Cromarty type long, horned cairn with a Camster-type chamber. It is 190ft long and varies from 25 to 45ft in width. 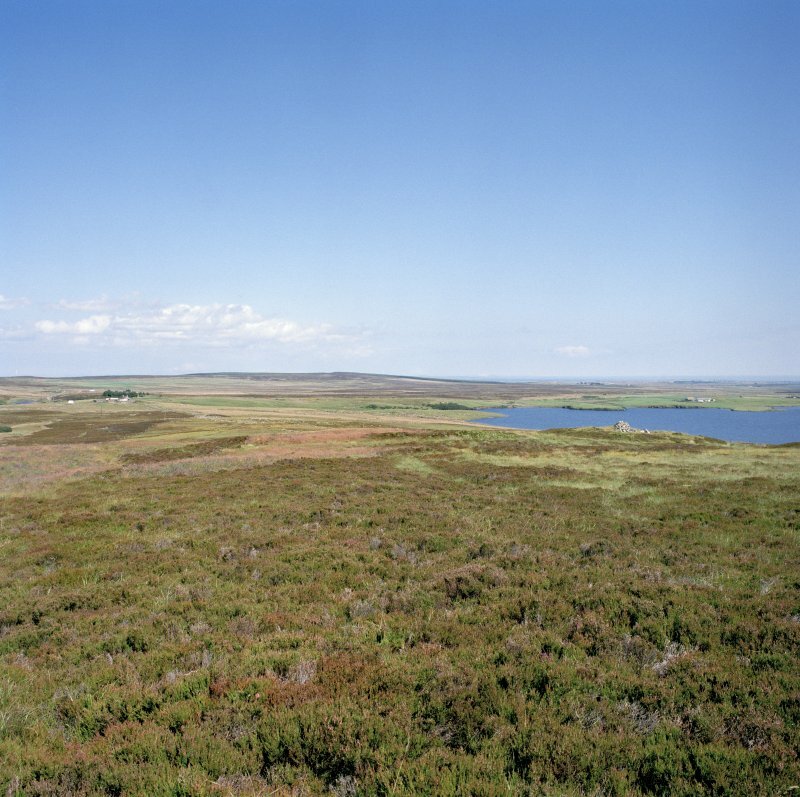 The site has been much robbed and is partly overgrown by peat and heather. The chamber has been re-used and a cist, which contained an urn and seventy 'tiny, round lignite disc beads' of a single string jet necklace, inserted in the outer compartment. Ten beads are in the NMAS (EO 132); the remaining finds have been lost. A S Henshall 1963; J G Callander 1916. As described and planned by Miss Henshall. Visited by OS (N K B) 2 May 1967. The cairn has a distinct 'head and tail' profile, and, in addition, the excavator noted a wall revetting the back of the round mound containing the chamber. 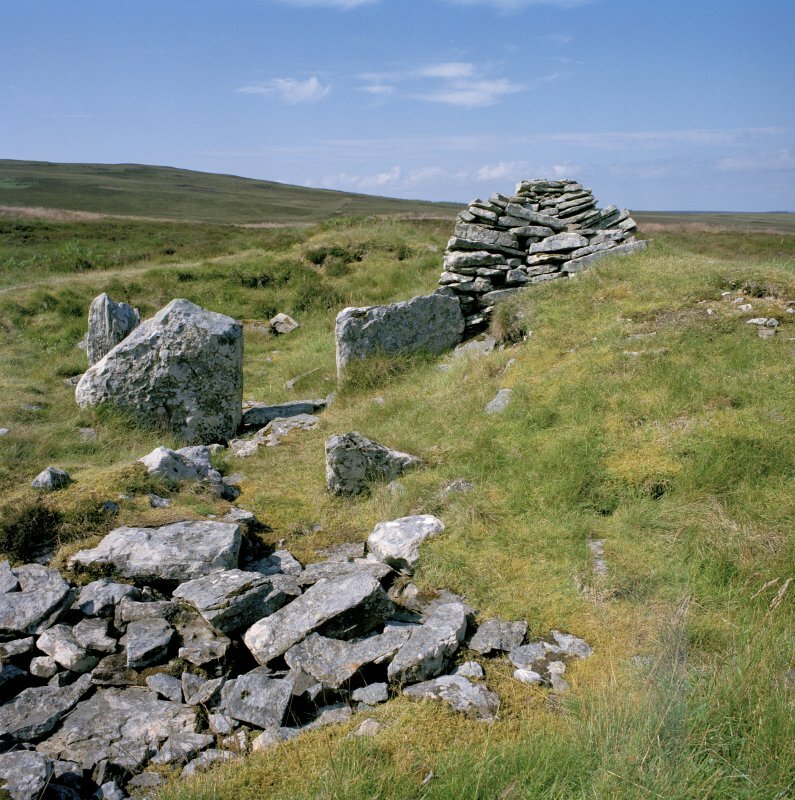 These facts, together with the very short passage, indicate that the cairn originated as a round, chambered cairn too small to effect the plan of the subsequent long cairn, except that the axes of cairn and chamber do not coincide. The cairn is probably relatively late in date. This is the northern of a pair of chambered cairns at South Yarrows, lying 190m NW of the steading and 250m N of its neighbour to the S (ND34SW 5). The cairn stands on the crest of a broad, heather-grown ridge that slopes gently down from S to N and falls more steeply to the E and W. The cairn measures about 52m from ENE to WSW by about 17m in breadth, increasing to 24m across the horns at its E end and about 11.3m across the horns at the W end. The cairn material rises up to 1.6m in height at the E end, where an axial burial-chamber is visible. The chamber was originally accessed by way of a passage that ran back into the body of the cairn from the centre of the concave forecourt. This passage measures about 3m in length by 1m in width; its ENE end has been blocked by crude walling, but at the WSW end there is a pair of portal stones framing an entrance 0.4m wide into an ante-chamber. The ante-chamber measures 1.6m in length by up to 1.8m in width and at its WNW end there are a thicker and taller pair of portals stones forming the entrance into the main chamber. The main chamber measures 4.8m in length by 2.7m in width and is constructed of edge-set slabs and drystone walling up to 1.2m in height. According to Anderson the main chamber was once divided into two compartments by another two upright slabs, but no trace of these are visible today. 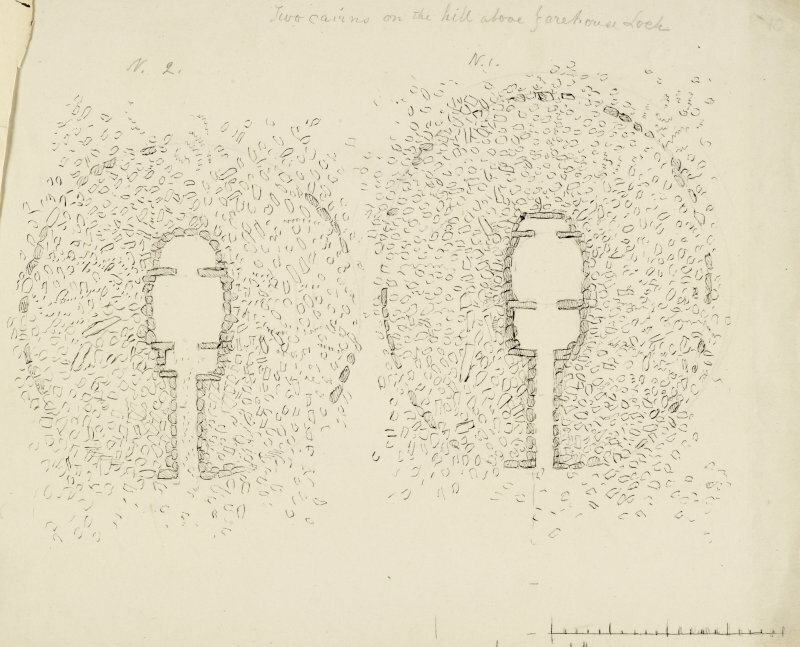 The visible remains of this cairn and the documentation that relates to the history of its 'exploration' strongly suggests that the E end of the cairn was originally a free-standing chambered round cairn with its chamber and passage aligned ENE and WSW. Later this cairn was extended to the WSW to form a long cairn, but the axis of the latter is at least 10 degrees to the N of that of the chamber and passage. The difference in height between the E end of the cairn and its tail has been accentuated by erosion in recent times, caused by a trackway that is used by wheeled vehicles crossing the cairn from N to S. The footings of a wall about 35m in length lie immediately E of the cairn (Mercer 1985, 223, No. 15, Fig.87). The whole trail from South Yarrows farm to the top of Warehouse Hill and back again takes some two hours or more, and involves steep climbs and some boggy areas, but the first two long cairns are quick and easy to reach. The trail is a mown path through heather, but the further cairns are off the path. Take this map or the trail leaflet with you to identify the cairns. From the carpark go down to the loch (two stiles over fences) to see a broch with outer defences and outbuildings, 1. These were cleared out in 1866-7 but have since become somewhat ruinous and also partly flooded since the level of the loch was raised. There is a long chamber in the wall of the broch leading off the side of one entrance, and the stairs once rose opposite this. A later wall has been built round the inner side of the broch to make it into a house, and the second entrance may be connected with this. The outbuildings belong to this secondary phase and include long curved structures which had rows of upright slabs inside to support the roof, as at Forse Wag (no. 94). The whole site was cut off by a ditch and bank running out to the loch at each end. Return to the start, and take the mown grassy path uphill through the heather to a series of cairns. Nearest to the carpark are two very long horned cairns which lie east-west across the flat top of the hill, some 30m apart. Both were excavated in 1865. The north cairn, 2, is somewhat overgrown with grass and heather and has a chamber at the higher east end where horns, not now visible, defined a semi-circular area in front of the entrance. This part of the cairn is divided by a narrow gap, possibly original, from a long rectangular extension with short horns at the west end. The south cairn, 3, a little higher up the hill, is 78m long and its horns are visible at both ends, as are traces of the wall-face that ran all round it. The chamber in the higher east end was divided into three compartments, the inner one still covered by a capstone, but there is confusing modern walling and dumps in the outer chamber and forecourt. The trail then continues up to Warehouse Hill. The next site reached is a flat-topped hill with steep sides that seems to have been a fort, 4, though the defences are hard to see. There are slight traces of rampart footings on the west side, and a heather-covered bank and ditch on the south; the location is very similar to Garrywhin (see no. 95). Next comes a standing stone, 5, with a larger slab lying by it which may have split off its face. Erected in the 2nd millennium BC, it has more recently been used as a parish boundary marker. The prominent stone cairn highest up the hill is also bronze age (though until recently confused with a different neolithic cairn). A cist or stone-lined grave some 2.5 m long, with human bones and a bronze spearhead, was found in it in the last century, perhaps a warrior buried with his spear. Little can be seen now but a hole in the middle, and disfiguring modern marker cairns (please do not add to these). Nearby is another neolithic chambered cairn, 7, apparently just a large round mound, but when the heather was burnt off in 1982 it was found to extend southwest as a long, low rectangle with horned ends. Part of the chamber can be seen. The last chambered cairn, 8, is now turf-covered. Many of the cairn stones have been removed and the whole passage and chamber with the dividing slabs lie open to view. From Warehouse Hill the path descends back north towards the loch. Just before a square fenced enclosure are two hut circles, 9, one east and one west of the path, part of a scattered settlement; these are quite hard to see in the heather. The trail returns to the carpark passing west of the farmhouse. From the carpark a pair of standing stones can be seen on the ridge east of the loch, where there is another chambered cairn. Also east of the loch at NO 312440 is a group of stone rows some 43m long, originally at least right rows set roughly parallel to one another, but now reduced to the remains of six, at a place called Battle Moss. These are only some of the early sites in the neighbourhood, and one wonders where the people who built all these monuments lived? Their tombs have been found but not their dwellings.